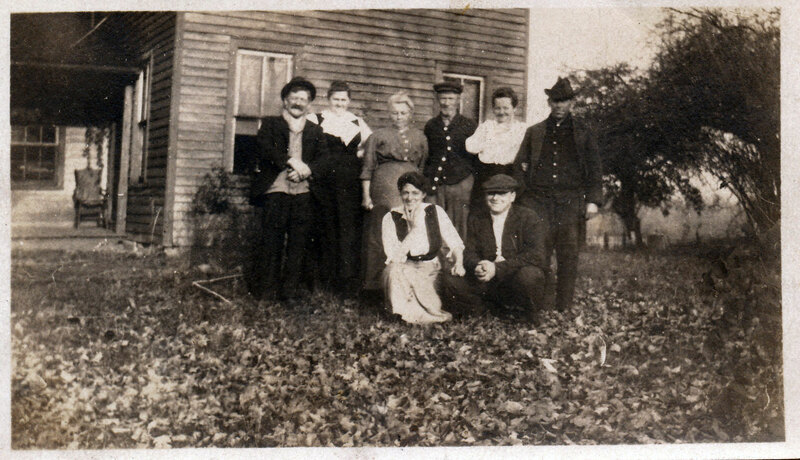 Rufus with daughter Frankie (middle) circa 1906The origins and lives of Rufus and Sarah Dodge probably make them one of the most mysterious, confusing, and intriguing couples in my family tree. They have definitely caused me the most grief in my digging, but in Sarah's case, the most rewarding when I found answers. 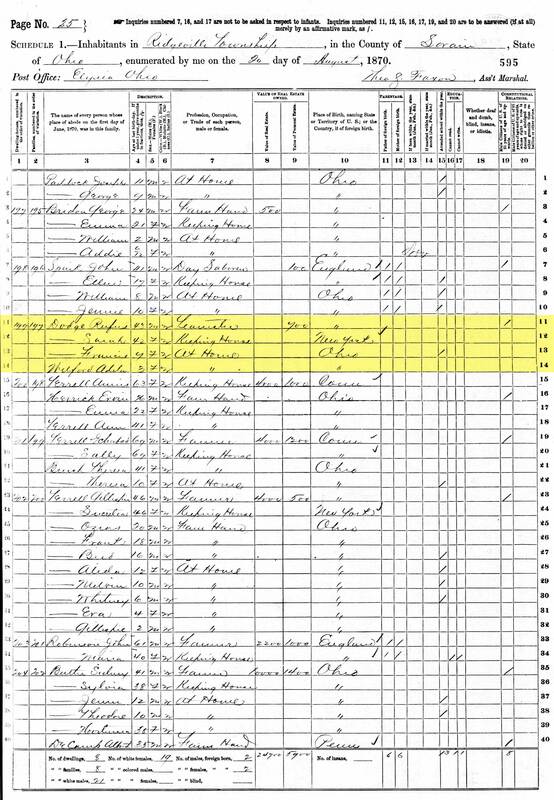 Dodge Family 1860 CensusTogether they lived in what’s written as Springfield, Mahoning, Ohio in 1860 where Rufus was working as a Day Laborer.12, F They would have 3 daughters, Harriet Adaline, Frances Jane and Georgia Anna. Rufus and Sarah liked to use nicknames and nicknamed their daughters Hattie, Frankie, and Georgie. 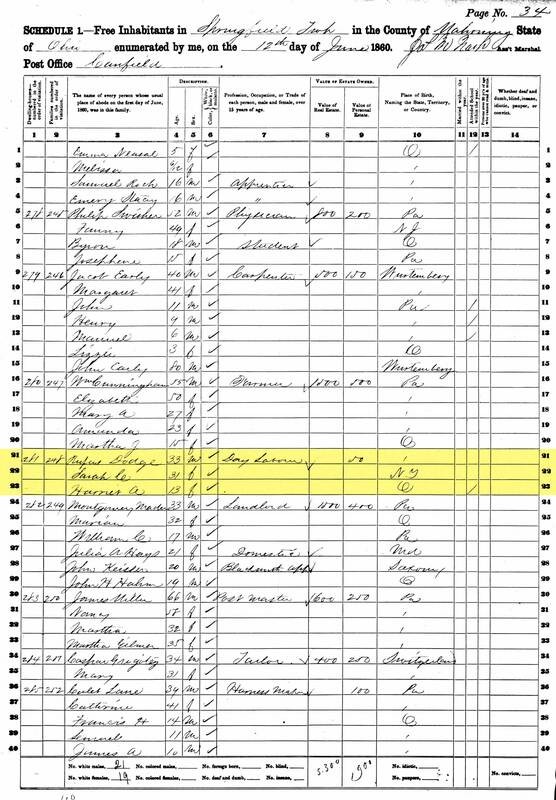 By 1863, Rufus is officially documented in the profession of stage coach driver in Springfield13 and later referred to as a Teamster. Rufus would have driven paying customers from town to town like a long distance taxi. It is believed he held this profession much longer than noted.G Stage coach driving was dying by the mid 1860's as the railroad was taking the passenger market away from stage coaches. The logical transformation was for Rufus to become a teamster. Teamsters would drive supply wagons pulled by horses from town to town making him the trucker or semi-truck driver of the 1800’s. 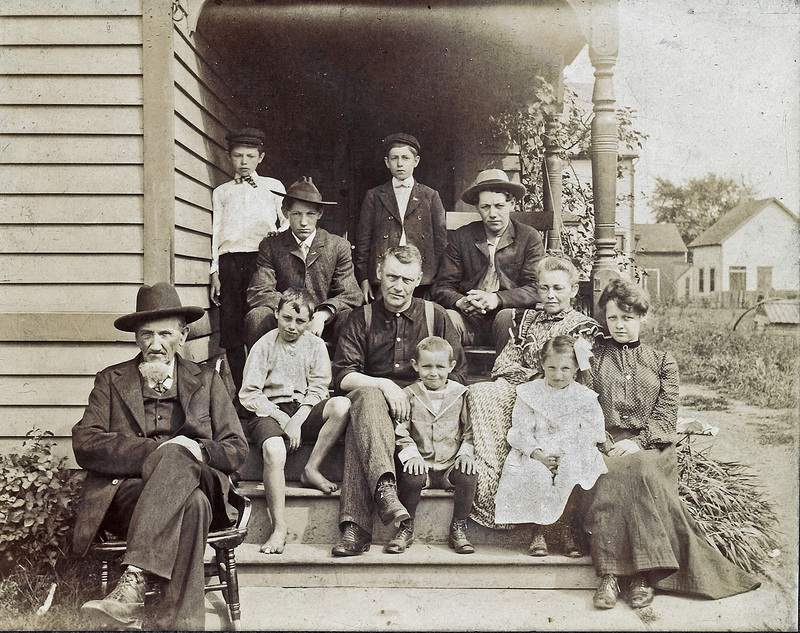 Sometime between 1900 and 1907 the Christian family, relocated to Medina, Ohio and bought a home at 240 North Huntington Street. Here Rufus lived out the final years of his life surrounded by his daughter and grandchildren. NOTE: Rufus' family and origins are officially unknown. 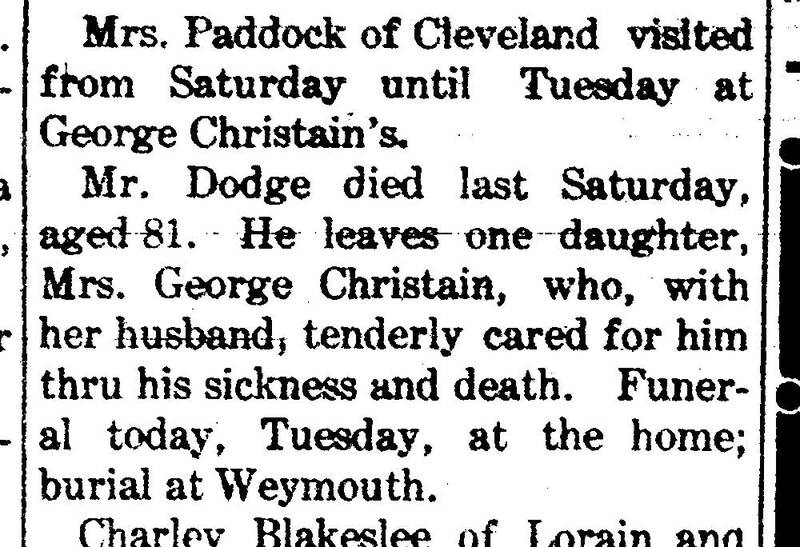 The only actual family we know if is a man named Daniel Dodge, died 30 Jan 1898 listed on the family bible's death records page. 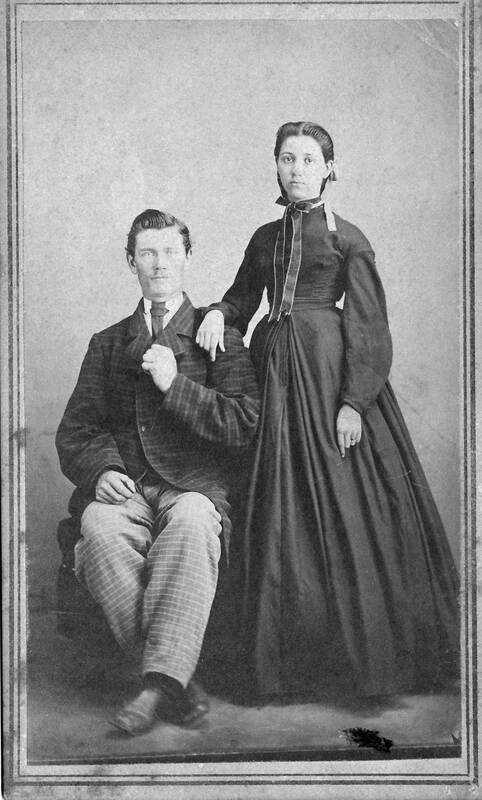 All other information is unknown... A relative of Rufus' daughter Harriet's husband Joseph Wilford (son-in-law to Rufus) is said to have moved to Ellis County, Kansas near a J.R. Dodge. This got me to track a Sgt. 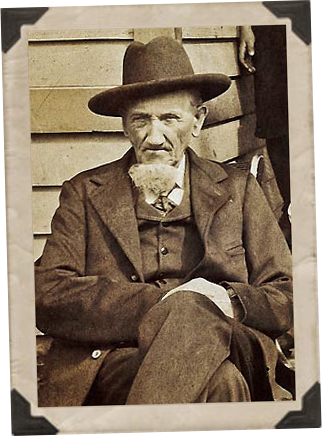 Daniel Dodge of Kansas, b.1834, veteran of the Civil War and native of NY. Married wife Emiline A. Fields in Scioto, Ohio 1 Apr 1855 and had 1st son John W. there in 1856. (Some accounts also list Rufus as being from NY). While complete speculation, it is a lead on a Daniel. 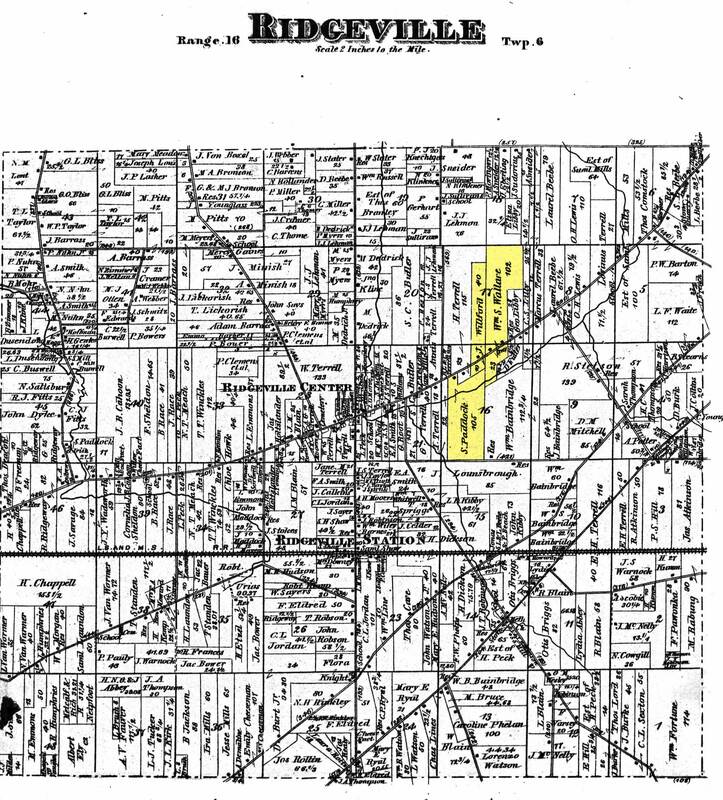 A Harpersfield, Ashtabula is sourced from an old family tree provided to my grandmother Kathryn Winkler from her cousin Betty Davis (of Welker Winkler)... A few Dodge families were living in Harpersfield in the early 1800's. 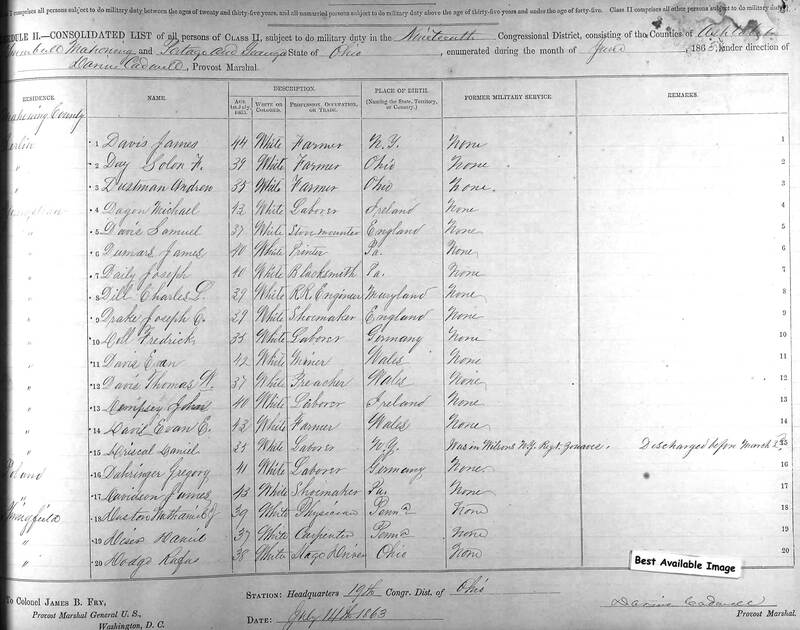 Rufus' death record lists Parkersfield, Ohio as his birthplace, but no such town seems to have ever existed and daughter's death record instead lists Pennsylvania as birthplace. 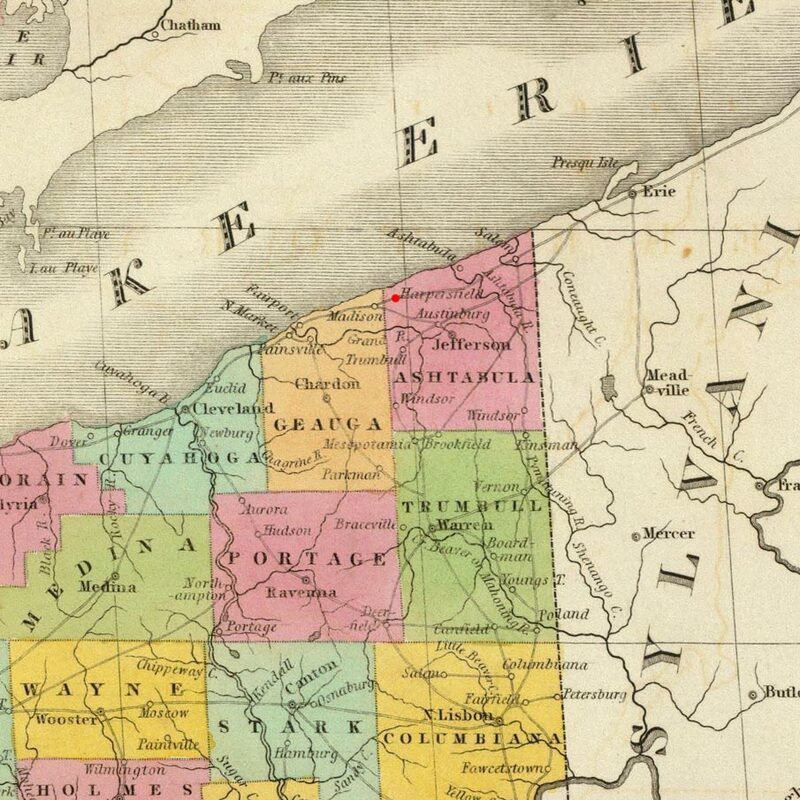 I believe Ohio is accurate based on the bulk of census records and a civil war draft registration claiming such. It would seem Parkersfield is a miss-understanding, hearing, remembering or transcription error of Harpersfield. 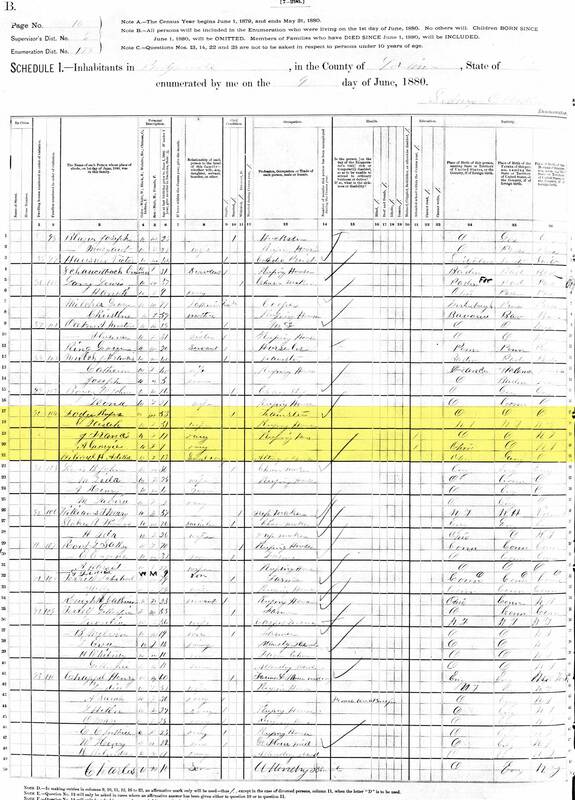 B Sarah's daughter's death record references her maiden name yet incorrectly lists her birthplace as North Ridgeville, Ohio. 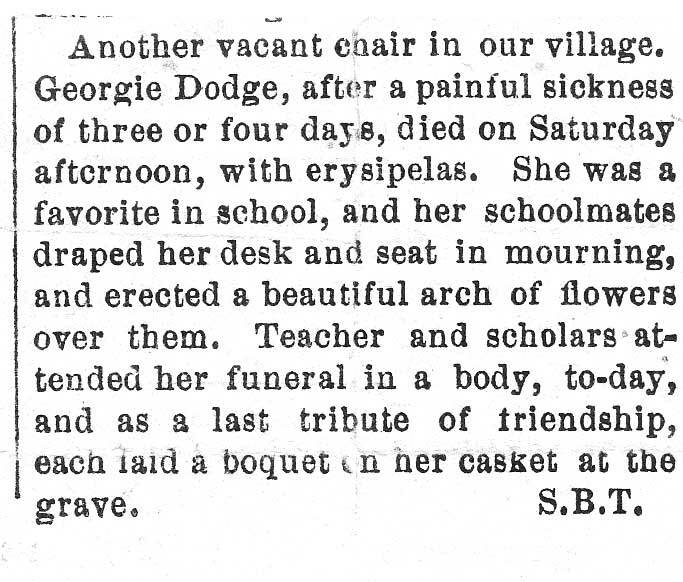 An uncited local obituary also lists her maiden name and provides a nickname "Sally" as well, however possibly in error. There is confusion about her year of birth that 1827 conflicts with her sister. It's likely Sarah was actually born in 1829. 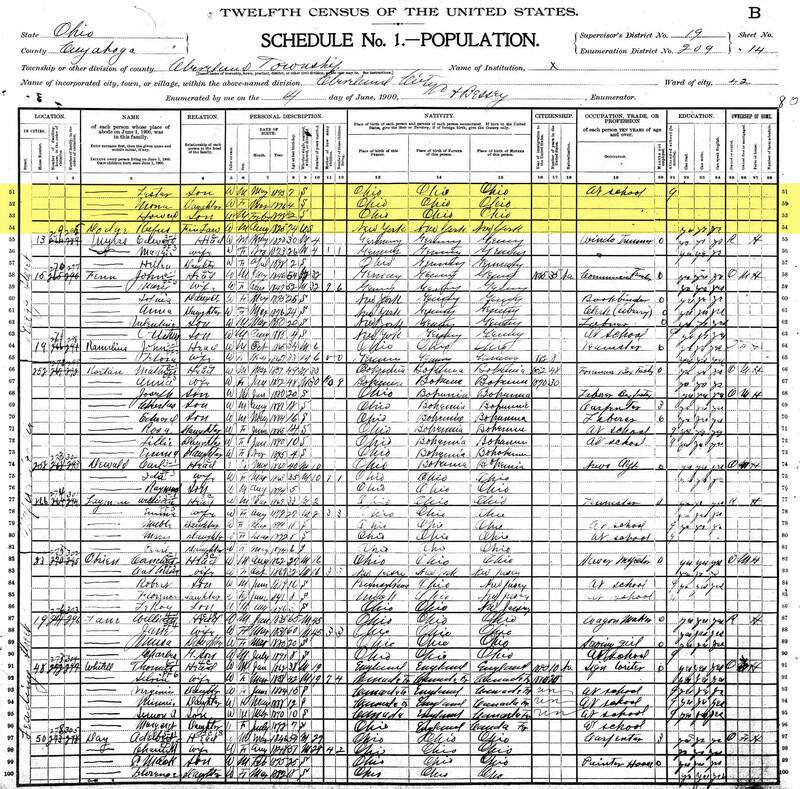 Not only is there a gap between Sarah's siblings that can place her here, but census records, where the information was likely to come from her directly, seem to average 1829 as her year of birth as well..
21 1900 United States Federal Census about Rufus Dodge; Year: 1900; Census Place: Cleveland Ward 42, Cuyahoga, Ohio; Roll: 1260; Page: 14B; Enumeration District: 0209; FHL microfilm: 1241260. 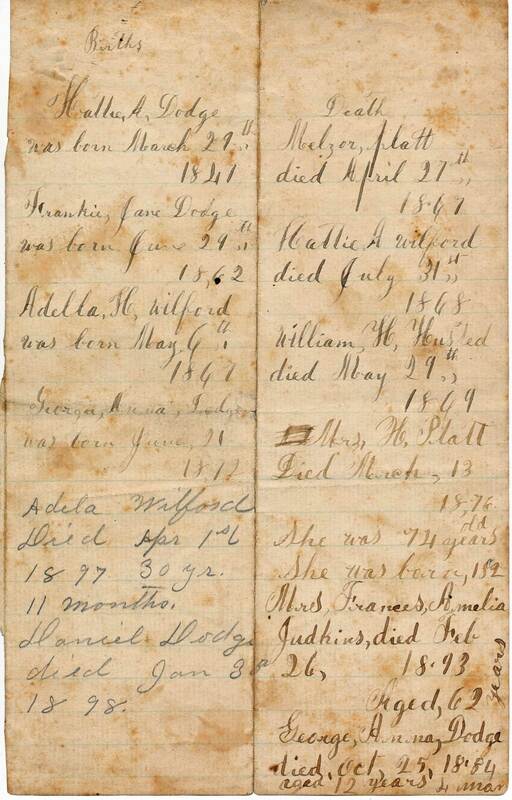 22 Ohio Record of Death for Rufus Dodge; "Ohio, Deaths and Burials, 1854-1997," index, FamilySearch (https://familysearch.org/pal:/MM9.1.1/F66L-ZPV) : accessed 30 June 2012), Rufus Dodge, 1907; Record of Deaths, Probate Court, Medina County, Ohio; vol. 3, pg. 106, entry no. 51. 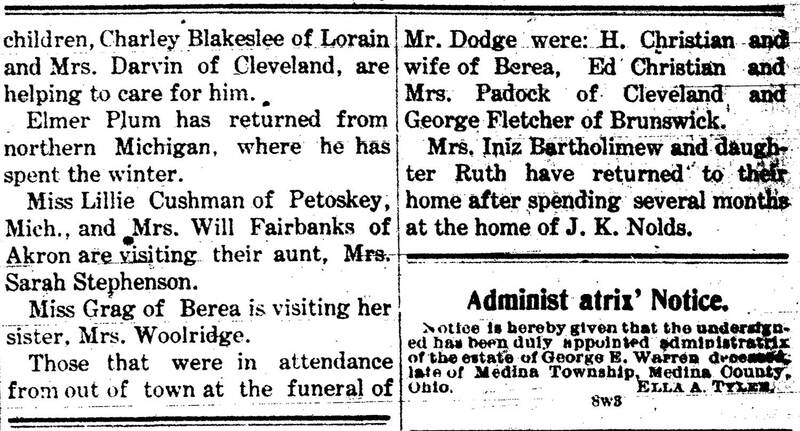 23 Death and Funeral Notice for Rufus Dodge; Article in the Medina County Gazette Newspaper; Medina, Medina County, Ohio; Tuesday, 26 February 1907; pg. 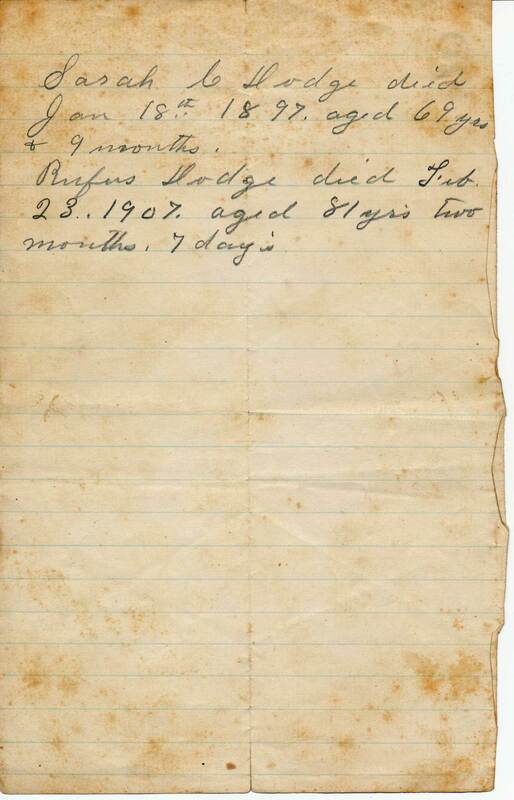 4; Reprinted Friday, 1 March 1907.